What is Newborn Screening (NBS)? NBS is a system that helps tell whether your baby is at increased risk for certain serious medical conditions. The screening involves a blood test, often incorrectly referred to as the PKU test but better known as the heel-stick test. It also involves a hearing screen. NBS is usually performed when your baby is 24-48 hours old, but sometimes later if your baby was born early. If your baby is born prematurely, the test may be done at 24-48 hours of birth and repeated when your baby is full-term. NBS is done to find out if your baby has a higher risk for having a disorder for which early treatment or management can prevent intellectual disability, physical disability, or even early death. How is the screen performed? The blood screen is performed by pricking your baby's heel and putting a few drops of blood on a special paper card. The card is allowed to dry and then is sent to the newborn screening laboratory where it is looked at for chemical abnormalities that may be a sign of a treatable medical condition. The hearing screen is done using a special machine, often while your baby is asleep. Parents who have no family history of these conditions and/or who have already had healthy children can still have children with these conditions. In fact, most children with these conditions are born into families with no history of the condition. What are the benefits of Newborn Screening? Early detection of disorders and conditions detectable through newborn screening is vital. Although the newborn screening detects conditions that cannot be cured, early management can be beneficial in most cases. Prevention: For most conditions screened, affected babies are at risk of intellectual disability, physical disabilities and even death if they are not diagnosed and treated early. Comprehensive newborn screening gives you the opportunity to protect your baby from the preventable complications of certain undiagnosed medical conditions. If your baby is affected by one of the conditions, newborn screening can play a key role in allowing your baby to live a better life. Babies who are born with these conditions and go unscreened sometimes spend several months, even years, suffering through numerous medical tests to find out the condition affecting them. Lack of diagnosis and proper treatment and management can lead to extensive hospital stays in intensive care, or even death. . Screening can identify the risk to a baby early in life, and prompt testing can be done to confirm the diagnosis. Peace of Mind: If your baby's test is normal, comprehensive newborn screening can give you some peace of mind about the conditions included in the screening. Most babies with the disorders included in newborn screening look and act normally and seem perfectly healthy. Newborn screening helps alert health care providers about a possible problem with your baby before it causes illness. 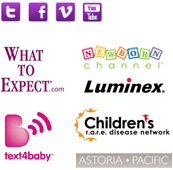 Most babies who are diagnosed early and treated promptly do well. The earlier the disorder is detected, the higher the chance of having a good prognosis. There are several reasons why your baby may need a second NBS. If there is not enough blood on the card or if the screening is difficult to interpret, the laboratory staff may ask for a second blood card. If there are mild abnormalities on the first screen, for either blood or hearing screening, a second screen may be requested to confirm the result. If the first screen suggests higher risk for a condition in your baby, the doctors will ask for blood and possibly urine samples to do special testing for the condition of concern (see below). And some states routinely do a second newborn screen on all babies. Whatever, the reason, being asked to have a “retest” done does not necessarily mean your baby has a disorder, but it is possible. If you are asked for a retest, it is important that you take your baby for the retest as soon as possible. How will I know the results of my baby's test? Generally, parents are notified of the test results only if there is a problem. However, it is a good idea to call your doctor, nurse, or clinic and request the results of the test, or ask for them in person when your baby has his or her first office visit, usually at about 2 weeks of age. This is important to ensure that your baby's test results have been accurately recorded into his or her medical records. If your baby's test shows an abnormal result, you will be notified immediately by telephone and given directions about what to do next. Follow the directions very carefully. If your baby's test is abnormal, additional tests are usually necessary to show whether your baby has the disorder. It is important that you tell your baby’s doctor, nurse, or clinic if you move or change phone numbers soon after your baby is born in case there is a problem with your baby's test and they need to contact you. It is also important to correctly complete the NBS information card in the hospital when the sample is collected, including your baby’s name and your contact information. If the results of your baby's test are normal, they will be mailed to your physician approximately two weeks after the test was performed. Will my baby get the same test no matter where I live? It depends. Although all states require a newborn screening test be performed on babies born in their state, each state determines which disorders will be part of their screening program. All states consider the NBS recommendations made by the Secretary’s Advisory Committee on Heritable Disorders in Newborns and Children, a federal panel that reports to the Secretary of Health and Human Services. Some states may not issue reports for all of the more than 50 disorders, often due to technical or budget issues. It is important for you to learn about the NBS done in your state.You can find more information about your state’s program, click here. Can Newborn Screening be performed on older children and adults? Screening of older children may be beneficial, however, this should be discussed with your baby’s caregiver. Should I have my baby screened in addition to the routine state screen? SBTS recommends first that you understand what is included in your state’s routine newborn screening process. Clarification of the disorders included in the screening process may require contact with the state newborn screening program. To contact your state’s newborn screening program click here. Families should consider obtaining additional screening for their baby if their state screen does not include all disorders recommended by the Secretary of Health and Human Services' Advisory Committee on Heritable Disorders in Newborns and Children (SACHDNC). The SACHDNC currently recommends two tiers of newborn screening disorders. While nearly all states screen for the first (core) tier (sometimes called the universal screening panel), states vary widely in their inclusion of disorders in the second tier (sometimes called secondary targets). If your state does not routinely screen for all of the disorders included in both tiers, the disorders not included can be obtained from specialized private laboratories. If you feel that additional newborn screening may be necessary, we recommend discussing it with your doctor to decide if it is right for your family. 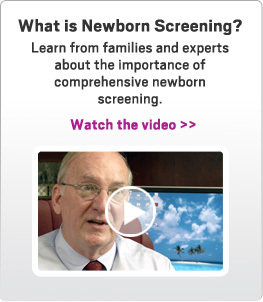 You can also contact SBTS at any time to learn more about additional newborn screening. If you wish to have screening for additional disorders, contact one of the laboratories listed on our site to obtain a parent packet. This packet contains screening materials and information for you and your physician. The screening packet should be obtained several weeks before your expected delivery date. Give the packet to your doctor, and let him or her know you would like to have the extra blood specimen collected at the time of your baby's routine newborn screening. At that time, a few extra drops of blood can be collected for the additional screening. Be sure that plans have been made in advance of your baby's due date. This will prevent any miscommunications about the additional specimen and will clear the way for additional drops of blood drops to be collected at the time of the routine newborn screen. (Note: Because of the laboratory procedures used, additional screening may also duplicate some of the testing included in the state screen). As with your baby's routine screening, if the additional tests show higher risk for a condition, your baby's doctor will be contacted immediately. And if the screening is normal, results will be mailed to your doctor. To complete the screening process, request the screening results from your doctor. For information on laboratories that provide additional screening click here. For information on how many disorders your state screens for click here. What if I don't have the money to purchase Additional Newborn Screening? If you have health insurance, ask the plan administrator or the insurance company if supplemental newborn screening is covered. The CPT (claim code) for insurance purposes is 83788. TheSave Babies Through Screening Foundation has a limited number of free newborn screening packets available each month for expectant parents who qualify. Go to Packets for Parents for more information. What if my baby's doctor doesn't know about Additional Newborn Screening?